UNDATED - For the week ending Sunday, mostly dry conditions continued to lower soil moisture ratings and stress in crops in much of the State. Scattered showers and thunderstorms moved across the southeast and west early in the week. Rainfall amounts were light, with the driest parts of the State receiving no rainfall. Producers began winter wheat harvest, while second cutting of alfalfa was ongoing. There were 6.1 days suitable for fieldwork. Topsoil moisture supplies rated 32 percent very short, 36 short, 30 adequate, and 2 surplus. Subsoil moisture supplies rated 28 percent very short, 35 short, 36 adequate, and 1 surplus. Winter wheat condition rated 26 percent very poor, 37 poor, 25 fair, 12 good, and 0 excellent. Winter wheat coloring was 80 percent, behind 93 last year, but ahead of 62 for the five-year average. Mature was 22 percent. Harvested was 7 percent, near 5 last year and 4 average. Spring wheat condition rated 32 percent very poor, 33 poor, 24 fair, 10 good, and 1 excellent. Spring wheat headed was 92 percent, near 89 last year, and ahead of 79 average. Coloring was 35 percent. Oats condition rated 19 percent very poor, 23 poor, 30 fair, 26 good, and 2 excellent. Oats headed was 92 percent, near 89 last year, and ahead of 85 average. Coloring was 48 percent, ahead of 39 average. Mature was 4 percent. Barley condition rated 39 percent very poor, 32 poor, 27 fair, 2 good, and 0 excellent. Barley headed was 91 percent, ahead of 78 last year, and well ahead of 70 average. Coloring was 36 percent, well ahead of 5 last year. Corn condition rated 7 percent very poor, 15 poor, 36 fair, 38 good, and 4 excellent. Soybean condition rated 8 percent very poor, 15 poor, 41 fair, 33 good, and 3 excellent. Soybeans blooming was 15 percent, behind 23 last year, and near 18 average. 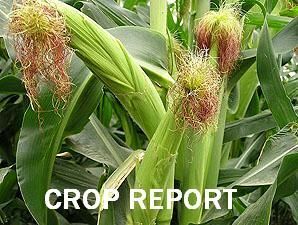 Sorghum condition rated 13 percent very poor, 19 poor, 57 fair, 11 good, and 0 excellent. Sorghum emerged was 90 percent, ahead of 85 last year, and near 86 average. Sunflower condition rated 5 percent very poor, 18 poor, 58 fair, 18 good, and 1 excellent. Sunflowers emerged was 88 percent, well ahead of 62 last year. Alfalfa condition rated 44 percent very poor, 35 poor, 13 fair, 7 good, and 1 excellent. Alfalfa first cutting was 89 percent complete, behind 94 last year, but ahead of 80 average. Second cutting was 20 percent, near 18 last year. Pasture and range condition rated 31 percent very poor, 26 poor, 26 fair, 15 good, and 2 excellent. Stock water supplies rated 14 percent very short, 26 short, 58 adequate, and 2 surplus.